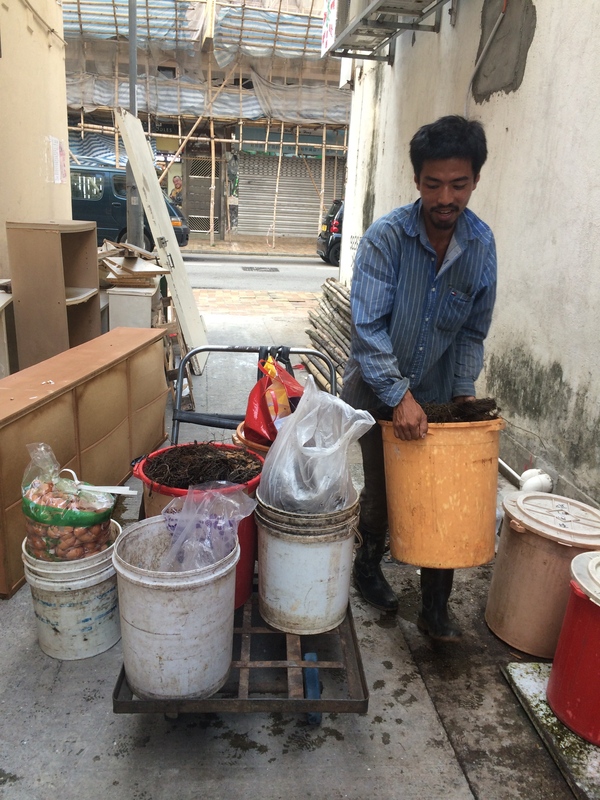 Everyday, after finishing his field work at Mapopo community farm, Farmer Chi Ho can been seen collecting food waste from local restaurants and drink shops around Leun Wo Hui. He brings 100kg of egg shells, shredded coconut, soya meal, tea and coffee grounds back to the farm where it is composted and turned into organic plant nutrients used to grow vegetables. Since he works every day, this amounts to Herculean 3 tons per month of reclaimed waste. Unlike the organic vegetables grown at Mapopo, most of the food we eat today is grown on large scale industrial farms, and shipped from hundreds if not thousands of miles aways. Our food waste, instead of being recycled back into plant nutrients, is discarded into the landfill. According to government statistics, food waste constitutes 36% of total landfill waste. Hong Konger’s generate 1.99kg of waste per person per day (in Japan it is 1.71kg, Singapore 1.49kg, and South Korea 1.24kg) and our landfills will be full in a couple of years. The governments position is that this requires a massive expansion of landfills that are vigorously opposed by the public, the building of unpopular incinerators and a few token food waste processing plants. Places such as Japan, Korea, Singapore and Taiwan have experienced decreases in landfill waste with the implementation of municipal waste charging fees and recycling programs. These common sense measures, while supported by the public, are opposed by the powerful business interests that select our political leaders. Landfill expansion is only half the story when food waste is dumped into a landfill. When organic matter, such as food waste, enters our landfill it decomposes anaerobically. This results in the release of methane, a greenhouse gas 20 times more efficient at trapping heat than CO2. Anaerobic decomposition is also what causes the stink from the landfill. In contrast, the aerobic composting method used by Chi Ho not only reduces landfill waste and methane emissions, but also virtually eliminates the stomach churning smell. This method mimics natures closed loop process where nothing goes to waste. It was also used by our ancestors to recover nutrients before the advent of cheap chemical fertilisers and distant farms made composting economically uncompetitive. Local farms reduce the distance our food travels. This benefits both the environment and the consumer. It benefits the environment through reduced greenhouse gas emissions. And according to a Harvard paper, locally grown produce is not only fresher but also retains more of its nutrients because it spends less time in transit. While compost has many benefits, without demand for it from growers, it is not economically viable. This is where local farms can play a role in reducing landfill waste by creating demand for compost. Growers in the UK for example, use composted municipal green waste as a growing medium. Most governments have agricultural policies that encourage local production because they recognise its contribution to food safety and security. The UK’s strictly enforced green belt policy protects agriculture and the countryside from being overwhelmed by real estate development. In contrast, at the behest of powerful business tycoons, the Hong Kong government is trying to ram through the North East corridor development that will displace villagers and turn vast tracts of agricultural land into more concrete jungles. While the government policy seeks to continue its environmentally destructive path, Chi Ho, with quiet determination, works to turn back the tide of waste one bucket at a time. Although he still does freelance work as video producer and editor, his decision to transition from being media professional to full-time farmer can only be described as making little financial sense. His back-breaking efforts collecting and composting food waste requires heavy physical labor with absolutely no personal reward. We can support his efforts by buying the produce that he grows. He’s making a real difference.